Ron Freeman is known to many different groups of people for a variety of reasons. To sports enthusiasts, Ron is remembered for his record-setting performance at the 1968 Olympics in Mexico City. 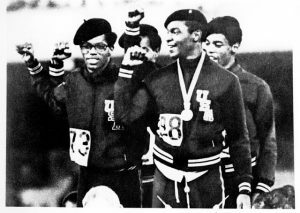 To civil rights activists, Ron is considered a hero in the civil rights movement for his powerful, silent protest on the medal podium wearing black berets and black socks. 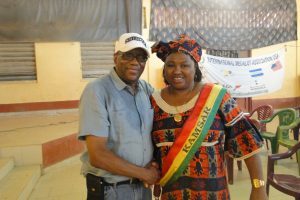 To young women in Guinea, Ron is the leader of the International Medalist Association, an impactful NGO with the goal to empower young women to stay in school, develop social and life skills, and be active. To all of us at The Foundation for Global Sports Development, Ron is a recipient of our 2017 Athletes in Excellence Award. Ron was nominated for the award by the U.S. Olympians and Paralympians Association. As a child growing up in the 50s and 60s in Elizabeth, New Jersey, Ron experienced numerous societal and health challenges, such as a heart condition, which he faced head on with self-determination. In high school his doctors cleared him to participate in track and field, where Ron found in himself remarkable talent. His coach, George Michaelides, also recognized Ron had something special in him. Ron attended Arizona State University and trained under Coach Baldy Castillo. After showing tremendous potential and being the number one 400 meter runner in the world, Ron Freeman became a member of the USA Olympic Team. At the 1968 Summer Olympics in Mexico City, Ron was on the men’s 4×400 meter relay team with Vincent Matthews, Larry James, and Lee Evans. The foursome wowed spectators with a record-setting performance of 2:56:16. Ron ran the fastest relay leg ever in Olympic history with a time of 43.2. Ron also won the bronze medal in the individual 400 meter race. At the time of the Olympics, many African American athletes recognized they could play a role in bringing attention to the injustices experienced by their community members. Some of their chief concerns were the racial disparities in education, health, housing, and employment. An organization named Olympic Project for Human Rights, which was comprised of the athletes, voted to use the Olympic Victory Stand as an opportunity to make a statement about these issues. Despite strong warnings from Avery Brundage, the President of the International Olympic Committee, the 4×400 meter team accepted their gold medals while wearing black socks and black berets, which they raised into the air. Watch Ron’s 4×400 meter race below. 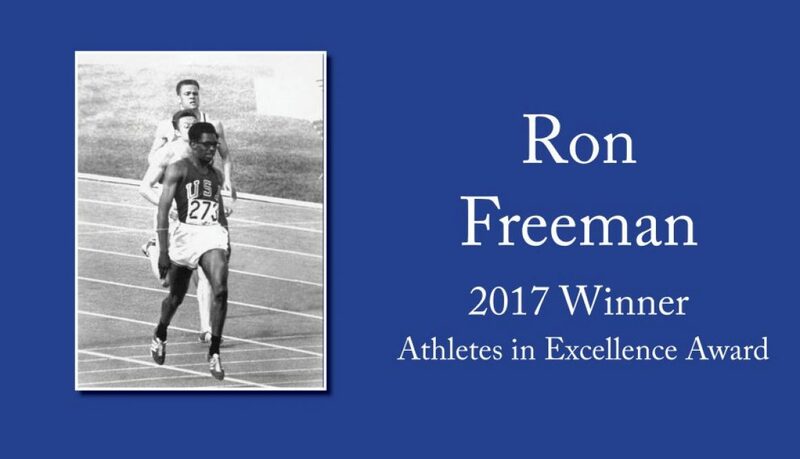 After his incredible showing at the ’68 Olympics, Ron attended graduate school at Kean University where he earned a M.A. in Counseling Psychology. As he became more involved in his community, he recognized a great need among the people. Beginning with after-school programs in his hometown, Ron went on to create the International Medalist Association (IMA) in 1998. This organization began as a vision of Ron and his teammates Larry and Lee. They wanted to use their status as Olympic medalists to make a positive impact on youth around the world. In Baltimore, Maryland the IMA specialized in providing underserved youth hot meals for dinner, after-school programs, university tours, tutors, educational summer camps, and more. These programs still exist and continue to enhance the lives of youth living in the area. In working with the U.S. Department of State, Ron had the opportunity to travel to West Africa and develop the largest multi-country youth peace initiative, based in Guinea. Here he experienced a personal connection with the country and the people who lived there. In 2006 Ron left the United States to reside in Conakry, Guinea, where he continued creating programs to improve the lives of young people. In Guinea and other developing countries, the IMA’s focus is on empowering girls and reducing gender inequity, promoting leadership and democracy, and providing recreational activities. Ron had noticed a striking difference between the youth in Guinea and the youth in the United States – the youth in Guinea didn’t have the opportunity to play, laugh, and smile the way youth in the U.S. did. Ron created the Double Dutch Program in West Africa, which teaches girls the game and provides them with jump ropes. Ron’s goal was to teach them a fun activity they could do anytime and anywhere. By incorporating recreation into these youths’ lives, the IMA is helping foster self-esteem, leadership skills, and most importantly – health and fitness. As part of the Double Dutch Program, the youth also learn about cleanliness, disease prevention, and education. Young women in Guinea and nearby developing countries often face difficulties in accessing education. For many reasons they eventually stop attending school. The IMA’s goal is to keep young women in school to improve their choices in life. One way the IMA does this is by developing public and private partnerships for funding, supplies, and educational resources and activities. One of their largest collaborations is with TOMS Shoes. Girls and boys ages 7-17 who remain in school each receive a pair of athletic shoes from TOMS each year. In total this program serves 36,000 students across the region. This program has grown tremendously. In 2011 they started with 24 girls, and that number has now grown to 18,000 girls and 500 schools participating. “2:55 and that ain’t no jive.” That was the rhyming song created by Ron Freeman and his teammates as they prepared for the 1968 Olympics in Mexico City. They were determined to break the 3:00 the world record for the 4×400 meter relay. Their talent and grit led them into success, and to this day Ron Freeman approaches life with the same joyful determination to make an impact. Now, he directs his energy to improving the lives of youth in Guinea, Africa. In contrast to his early days in Guinea, Ron sees more youth smiling and enjoying life. Watch Ron’s award acceptance video. Learn more about GSD’s Athletes in Excellence Award here. Hannah MacDougall is no stranger to challenges. 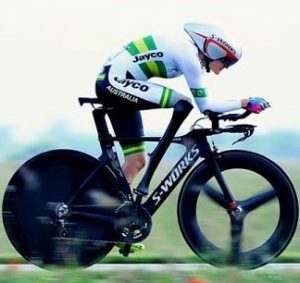 Just in 2017 the thirty-year-old Paralympian submitted her PhD dissertation, competed at the 2017 UCI Para-cycling Road World Championships and in two different Road Race World Cups, where she won Gold and Silver medals. Hannah accomplished all of this while volunteering with multiple organizations and for a variety of causes. Any one of these activities alone would be enough to overwhelm even the most capable person, but to Hannah these are integral pieces of her overall health. 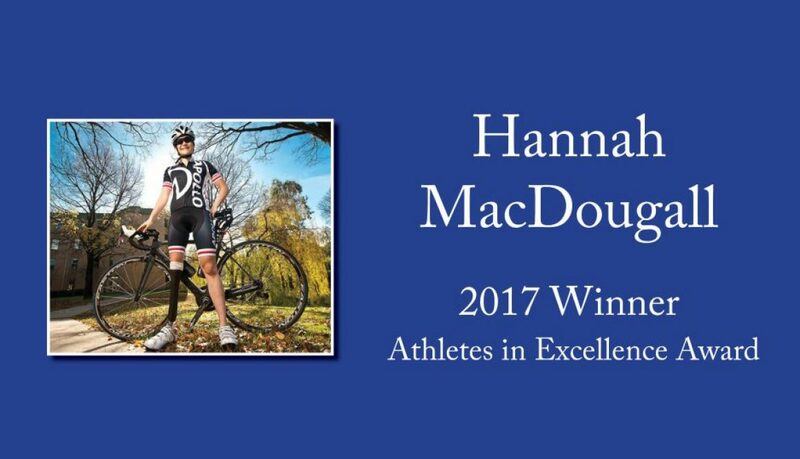 For her many achievements and dedication to athlete well-being, Hannah was selected as one of our 2017 Athletes in Excellence Award winners. She was nominated by Bernadette Sierwakowski at the Victorian Institute of Sport. Athlete well-being is essential to Hannah. In fact, the topic is so important she has focused her PhD work on this very subject. In this space she coaches young and elite athletes how to develop skills and behaviors that will contribute to their overall well-being, such as strong support networks, balanced lifestyle, resilience, mindfulness, and more. You can view her presentation, “Managing the Life of an Elite Athlete,” on YouTube. Hannah’s contributions to her community extend beyond coaching athletes on well being. She is an Ambassador for Access for All Abilities, an organization in Melbourne that connects people with disabilities to sports and recreational opportunities. Hannah is also and Ambassador for the Just BU and Start Foundation. Hannah started her athletic career as a swimmer, but in recent years she has transitioned to cycling. Learn more about the Athletes in Excellence Award here.